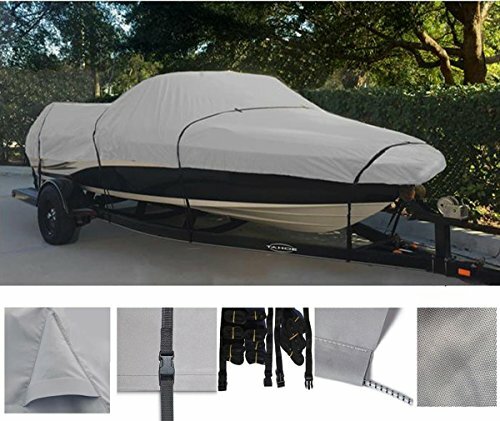 Our Boat Cover will provide all year round outdoor and indoor protection. -Designed for Trailering purposes, as well as storage and mooring of your Boat. -It will efficiently shield your Boat from all finish-destroying agents: sun, rain, snow, dust, dirt, mold, mildew and other corruptive elements. -Investing in Our quality Cover is not only a practical move, but also the perfect option for maintaining of your Boat. Color: GREY. Heavy-duty 600 Denier, woven polyester marine canvas for durability and weather resistance. Integrated buckle and strap system for easy fitting and trailering. Comes with convenient Storage Bag and trailering straps. NEW, IMPROVED TECHNOLOGY: Heavy-Duty, Breathable, Water repellent, 600 DENIER Urethane Coated MARINE Grade Woven Polyester. Non scratch reinforced corners and middle section of the cover. Fully Elasticized elastic hem around the bottom:To provide a secure fit. If you have any questions about this product by SBU, contact us by completing and submitting the form below. If you are looking for a specif part number, please include it with your message.